You've just spent the afternoon snapping photos of all the treasures you're sure will fetch big bucks on eBay. But somehow, the pictures don't convey the awesomeness you want buyers to see when they look at your listings. What now? Don't scrap your dreams of PowerSeller glory just because your pictures are less than magnificent. A simple tweak of your lighting or your camera settings usually does the trickusing a digital camera makes this a lot easier because you can quickly view the image, and reshoot if necessary, before you go ahead and upload it to your computer. Still you may find your auction photos need some minor fixes before they are truly eBay-worthy. We're talking a crop here, a rotate there, maybe a slight correction to contrast or white balance. Because let's face it, much more than that and you're walking a fine line between displaying your item in the best possible light and misrepresenting what it actually looks like. Here's where photo editing software comes in handy. And don't fret: You don't have to go out and spend top dollar on professional tools like Photoshop in order to get good results. The Web is loaded with software programs that are well suited for the basic editing chores most users need to doand more. There is, literally, something for everyone at all levels of skill and price. Just type "photo editing software" into a search engine, and you'll find an overwhelming assortment of downloadable tools at your fingertips. To make the selection process more manageable, we've checked out some of the more intriguing offerings and narrowed the field to a handful of promising applications that would serve the needs of most online sellers. Free software is easy to find on the Internet, but not all of it is worth your time to download. Here are few free products that are. And they all have a range of features to satisfy novice and experienced users alike. FastStone Image Viewer, www.faststone.org/index.htm. Marketed mainly as an image viewer, a peek inside the menus reveals that FastStone does much more. If you open a photo and right-click on it with your mouse, up pops a menu with several options, including "edit." Click that and viola, common editing functions like color adjustment, image resize, rotate/flip, crop, sharpen, blur, brightness and contrast are all there. It's easy to use, not at all intimidating andin case you missed itit's free. Another neat feature about the FastStone viewer is, if it doesn't go far enough for you as an editing tool you can use it as a browser to launch other, more powerful editing software you may already have on your computer. GNU Image Manipulation Program (GIMP), www.gimp.org. GIMP is an open-source image editor that was developed to run on Linux, but now offers versions for Windows and Mac as well. For a gimme, it's surprisingly feature richit's probably closer to the capabilities of Photoshop than other free offerings. But more capabilities may also mean more complexity. It is certainly not as user friendly as, say, Photoshop Elements. Then again, Elements costs $100 and GIMP is… yep, free. Paint.net, www.getpaint.net. Paint.net is basically Microsoft Paint on steroids. (Remember Paint? It's in your Windows "Accessories" folder). Paint.net comes with basic image editing capabilities, plus advanced features like layers, curves, a gradient tool, and other stuff for more advanced types. However, being a Microsoft freebie, it's good for Windows onlyno Macs! Photoshop Express, www.photoshop.com/express. Courtesy of the "big daddy" of photo editing comes this free Web application, scaled down to suit images that will be displayed online. Still in beta release (which means there may be a few kinks and bugs to be worked out), Express combines the editing capabilities of Photoshop's consumer product, Elements, with the social networking aspects of album-sharing sites like Flickr and Picasa. Express has the look and feel of a desktop photo editor, but it's Web-based, meaning your images are stored on a remote server. You do need to have installed the latest version of Adobe Flash (also free) in order to run Photoshop Express. Picasa, picasa.google.com. 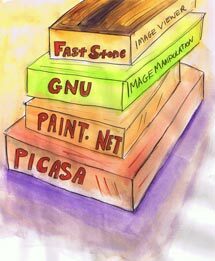 Picasa is primarily a Web-based photo-sharing application, but basic editing tasks like cropping, red-eye removal, contrast, and color adjustment are all there. A simple point and click interface makes it easy to use. However, Picasa also has some more advanced features like RGB histograms for those who are interested. When you download Picasa, it instantly gets to work scanning and organizing the photos you have stored on your hard drive. Seems a tad Orwellianbut hey, what else would you expect from the folks at Google? If you're doing more with photography than just uploading product images to your eBay listings, it may be worthwhile to invest in a full-blown photo editing package. Software geared toward seasoned and professional users can run into the hundreds of dollars, but you don't have to pay that much to get quality tools. Bling! It, www.blingit.us. This tool is useful for removing product images from boring or distracting backgrounds. Bling! It is made by Vertus, which has a good reputation with a high-end Photoshop plugin that uses the same technology. Cost is $49.95. Photoshop Elements, www.adobe.com/products/photoshopelwin/features. A good choice for product shots if you are also a photo hobbyist and need all the bells and whistles. Elements has some good capabilities to fix common flaws and accomplish various editing chores-commonly used functions like rotate left/right, red-eye removal, adjusting saturation, sharpening, popping colors, converting to black and white and lots more are included. It's developed by Adobe Systems, which also makes Photoshop. But this does 80 percent or more of what Photoshop does for one-sixth the price. Cost is currently $99.99 for a full license, or $79.99 if you're upgrading from a previous version. Photoshop CS/3, www.adobe.com/products/photoshop/photoshop/prophotographer. Photoshop is the "gold standard" in image editors for advanced amateur photographers and professionals, but is overkill for almost everyone else. Because it's so high-end, there is a long learning curve. It's also very expensive: $649 for the full product; $200 for an upgrade.